WASHINGTON — Steve Bannon is on the run, and his guerrilla war against the Republican establishment is on the verge of being extinguished after his political patron, Donald Trump, accused him Wednesday of having "lost his mind" and of being "only in it for himself." In a stunning 266-word statement of rebuke against his former campaign aide and White House strategist, a clearly infuriated Trump echoed and expanded on the criticisms that establishment Republicans have leveled against Bannon since he took over the Trump campaign in August 2016. The immediate impetus for Trump's broadside was the Wednesday publication of excerpts of a forthcoming book — Michael Wolff's "Fire and Fury: Inside the Trump White House" — in which Bannon is quoted as saying that a meeting between Russian emissaries and members of the Trump campaign, including the president's son Donald Jr. and son-in-law, Jared Kushner, was "treasonous" and "unpatriotic." Veteran GOP strategist Ed Rollins said on Fox News late Wednesday night that Bannon had effectively "set himself on fire in the middle of the south lawn and the president ran over him with a tank, then he put it in reverse and backed over him again." "I think it's the end of Bannon," Rollins said. Already, candidates long identified with Bannon are starting to distance themselves from him and pledge their allegiance to Trump. "I strongly denounce the comments by Steve Bannon as quoted by Michael Wolff," said former Rep. Michael Grimm, a New York Republican who is seeking to re-take his old Staten Island House seat. "They are baseless attacks against the president's family, beyond disturbing, and I fully support our commander in chief." Zachery Henry, spokesman for Kelli Ward, an Arizona Republican hoping to succeed retiring Sen. Jeff Flake, said that Bannon is "only one of the many high-profile endorsements Dr. Ward has received" and that Ward is committed to "helping President Trump advance an America First agenda." The revelations in the new book are not the only reason Trump moved decisively to crush the anti-establishment rebellion his former aide has been trying to foment within the GOP. 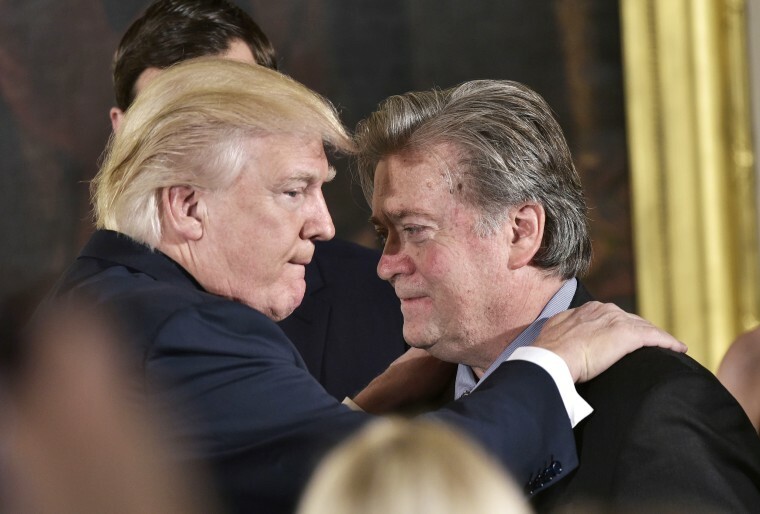 Bannon has waged political war against Senate Majority Leader Mitch McConnell, R-Ky., and House Speaker Paul Ryan, R-Wis., the two leaders who just delivered a major tax cut law to the president's desk and with whom Trump must work to advance his legislative agenda. After Trump released his statement excoriating Bannon, McConnell's campaign team tweeted a picture of the Kentucky senator smiling. Bannon has tried to terrorize a string of sitting Republican senators — the lawmakers who vote on Trump's priorities — by threatening to support primary challengers against them and using his Breitbart media platform to deride and harass them. And, in what may have been the real turning point for Bannon, the candidate he helped push to victory over Sen. Luther Strange in an Alabama Senate Republican primary last year, Roy Moore, ended up losing to Democrat Doug Jones in a deep red state. Bannon continued to back Moore after he was accused by multiple women of sexual misconduct and pressured Trump to do the same. The defeat of Moore was a stain on both Trump and Bannon, who declined to talk to the media on election night, and a sore point for the president. Perhaps most galling to Trump were Bannon's repeated insinuations that he was the guardian of Trump's political movement after the 2016 election, closer to it than a president who could be swayed by "globalist" advisers and relatives who had been given too much influence. "Now that he is on his own, Steve is learning that winning isn't as easy as I make it look," Trump said in the statement. "Steve had very little to do with our historic victory, which was delivered by the forgotten men and women of this country. Yet Steve had everything to do with the loss of a Senate seat in Alabama held for more than thirty years by Republicans. Steve doesn’t represent my base — he’s only in it for himself." Trump's attack on Bannon unleashed a series of aftershocks from establishment Republicans. "Time for Bannon to disappear or find work in a circus," Rep. Peter King of New York wrote on Twitter. But at least one of Bannon's favored candidates, Mississippi state Sen. Chris McDaniel, who plans to announce this month whether he'll mount a primary challenge to Sen. Roger Wicker, shied away from criticizing either Trump or his former strategist. "The establishment swamp monsters in Washington would like nothing more than to refill the Swamp," McDaniel told NBC News in an email. "Conservatives need to work together, not tear each other apart. If we are divided, they win. We can't let them win." Bannon did not respond to an NBC request for comment. He broke a day-long silence in the wake of Trump's rebuke while hosting "Breitbart News Tonight" on SiriusXM late Wednesday. "The president of the United States is a great man. You know I support him day in and day out," Bannon said in response to a caller seeking to defend Bannon from Trump's attack. In the past, he's wavered on Trump's political sustainability, having told The New York Times two months ago that the president would win re-election "with 400 electoral votes" and Vanity Fair more recently that he gives Trump only a 30 percent chance of serving out his first term. Until Wednesday, though, Trump had resisted pressure to sever ties with Bannon. Despite having fired Bannon from his White House job last August, Trump had spoken well of his onetime strategist. "Steve's been a friend of mine for a long time, I like Steve a lot," Trump said in October. The president further said that in trying to promote primary challengers to incumbent Republicans, "Steve is doing what he thinks is the right thing." But even before the Trump's about-face, Bannon was showing signs of retreat. Earlier in the day, a person close to him said that Bannon was unlikely to recruit primary candidates in Utah, where longtime Trump bête noire Mitt Romney is the prohibitive favorite to succeed retiring Sen. Orrin Hatch, or Minnesota, where Republicans harbor some hopes of capturing the Senate seat that Democrat Al Franken resigned. Instead — like a general who hopes to weaken an enemy army without directly going into battle — Bannon is likely to harass Romney through Breitbart and other conservative outlets, the person close to him said. Michael Steele, a former Republican National Committee chairman, said that might backfire. "Mitt Romney will get stronger the more Bannon and Breitbart and others go after him," Steele said. The one sin for which Trump seemed most unwilling to forgive Bannon: his cultivation of the mainstream media that the president so often dismisses as "fake news." "Steve pretends to be at war with the media, which he calls the opposition party, yet he spent his time at the White House leaking false information to the media to make himself seem far more important than he was," Trump said Wednesday. "It is the only thing he does well."